News Corp's acquisition of MySpace has worked out well so far. But other media giants should not overpay for social networking sites. NEW YORK (CNNMoney.com) -- Banker David Hannum, and not P.T. Barnum as widely believed, once said that "there's a sucker born every minute." That axiom may yet prove true for major media companies in the coming months. News Corp.'s purchase of Intermix Media, parent company of the uber-popular social networking site MySpace, for $580 million last year has created shock waves throughout the traditional media industry. MySpace's growth potential may cause other media companies to spend big bucks on rival social networking sites like Facebook or Bebo. My$pace: Investors like the prospects for MySpace and that's one reason why the stock has outperformed shares of top media rivals. With News Corp.'s stock rising nearly 20 percent so far this year, partly due to enthusiasm about the growth potential of MySpace, other "old" media firms are now said to be scrambling to find their own MySpace so they too can tell advertisers they have a huge audience of teens and young adults that are just dying to spend money on gadgets, movies, music and other trivial pursuits. And I fear that the rush to become a hipster online play could lead media companies like Walt Disney, Viacom and my parent company Time Warner to repeat the mistakes many of them made at the height of the last dot.com mania and overpay in their attempts to uh, out-Fox News Corp. and MySpace. It appears that News Corp. (Charts) was savvy and scooped up Intermix for a bargain of a price. But other social networking sites, sensing the desperation among the larger media companies, now seem to be holding out for even bigger paydays. Should Facebook and YouTube be worth more than MySpace? Rumor has it that MySpace competitor Facebook has been looking to sell out and allegedly turned down a $750 million buyout offer. Management's supposed asking price? $2 billion. If a big media company is willing to buy Facebook, which doesn't have the traffic of MySpace, for more than three times the price of Intermix, then that would be the surest sign yet that media companies are hopeless suckers. Heck, even a $750 million price tag may be too much. 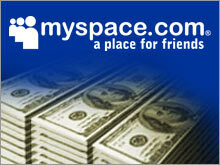 If the online social networking business were one big Monopoly game, MySpace was arguably Boardwalk. So there's no need for other media giants to shell out even bigger bucks for the Web's equivalent of Illinois Avenue and Marvin Gardens. Keep in mind that there was more to Intermix than MySpace. It also owned gaming site Grab.com and e-commerce site Alena. Plus, Intermix had a decent revenue stream before News Corp. bought it. The company generated sales of about $79 million in fiscal 2005. Facebook isn't the only private company that bloggers and other tech cognoscenti are buzzing about. Another social networking site, Britain's Bebo.com, is rumored to have received interest from Viacom (Charts), Yahoo! (Charts) and British Telecom. People have speculated that Bebo might be trying to get $1 billion in a sale. And according to a recent cover story in BusinessWeek, sources said that Digg.com, the tech news and gossip site that relies on user-generated content, could easily be worth $200 million...even though the magazine says Digg is breaking even on only $3 million in annual sales. That would value Digg at 67 times trailing sales. Let's put that in perspective. Yahoo trades for about 7 times last year's sales and even Google (Charts) trades at 19 times last year's revenue. And News Corp's purchase of Intermix valued that company at only 7 times Intermix's sales from fiscal 2005. Don't get me wrong. Digg is a pretty cool site. But should it be worth that much of a premium to MySpace or the two leading online search companies? The BusinessWeek article also cited people saying that online video wunderkind YouTube could be worth $500 million. Others have suggested that YouTube could fetch as much as $1 billion in a sale. That's amazing since it's not yet clear just how much money YouTube really will be able to generate in ad revenue. Yes, social networking is undeniably hot right now. But media companies will avoid making the same mistakes they did a few years ago and not overpay for "clicks." Eyeballs don't matter. Sales and profits do. In the late 1990s, many of the big media companies felt that they had to have a Web portal since companies like Yahoo, Excite and Lycos were all the rage. Walt Disney (Charts) spent more than $2 billion on Web search firm Infoseek, changed the name to Go.com and then set up a tracking stock for its Internet unit. That failed miserably and Disney shut down most of the site's operations in 2001. It exists now as a site that simply links to other Disney corporate sites. Not to be outdone, General Electric's (Charts) NBC created a publicly traded company in 1999 called NBC Internet by purchasing stakes in online community site Xoom.com and portal Snap.com. That deal was valued at about $4 billion and NBC owned about half of the online entity when it went public. But NBC Internet was also a flop and NBC wound up buying the remaining shares of the company in 2001 for a mere $85 million. And do I even need to mention how poorly that little merger between Time Warner (Charts) and AOL has fared? Of course, part of the reason these moves didn't pan out was because the dot-com bubble burst and the economy sunk into a recession. Many would probably argue that this time, it's different. But there is an important lesson here that media companies need to remember. The online advertising market may be sizzling now but it is still advertising. And advertising is a business that does not hold up well when the economy cools. I'm not trying to suggest that we are heading towards another recession. But I do think it would be reckless for media companies to overpay for companies whose fortunes depend on advertising just as the economy is starting to show signs of slowing. Finally, it's worth noting that despite all the hype about Web 2.0, all of this excitement hasn't led any social networking companies to go public yet. If social networking companies were convinced that they really had viable, lucrative long-term business models, then why haven't the YouTubes, Facebooks and Bebos of the world tried to test the public waters so they could be the next Google? One reason could be that these companies may be aware that being popular now is not a guarantee that you'll remain on top for the long haul. Hear a lot of buzz about Friendster lately? And perhaps, venture capitalists backing these firms realize that institutional and retail investors don't want to get fooled again, that paying nosebleed prices for unprofitable or barely profitable Internet companies that rely on fickle advertisers is not a good idea. It remains to be seen if big media companies will be able to exercise similar restraint.